RJ, a Harley Davidson riding Economist, agreed to do a written interview about his tattoo to share on this site. You told me the meaning of the Maasai shield source of your tattoo, but I can’t do justice to it — could you explain it for us? The Maasai Warriors are protectors of the tribe and the spear and shield are the symbol of that role. Typically younger warriors are allowed to use black, grey and white dyes on their shields while red is reserved for more experienced warriors. At times tribal chiefs give permission for red to be used. Is there another tattoo that you are thinking about getting? I am in the process of designing a half sleeve. The difficulty of the design is that there is an existing tattoo on the arm. The tattoo is meaningful so I hope to preserve part of it while adding something more meaningful for this stage of my life. Wish me luck! People sometimes say that tattoos are a “market bubble” that’s bound to burst. Now, tattoos are weird “commodities.” They technically lose their market value, once the artist has been paid. Because of such features of tattoos, I have wondered if it is correct to think of “bubbles” like the real estate or .com bubbles when it comes to this market — what are your thoughts? Body art is quite “popular” at the moment. I think lots of people are riding the wave of acceptability with which tattoos are met. There are some bubble-like aspects to the present state of body art. 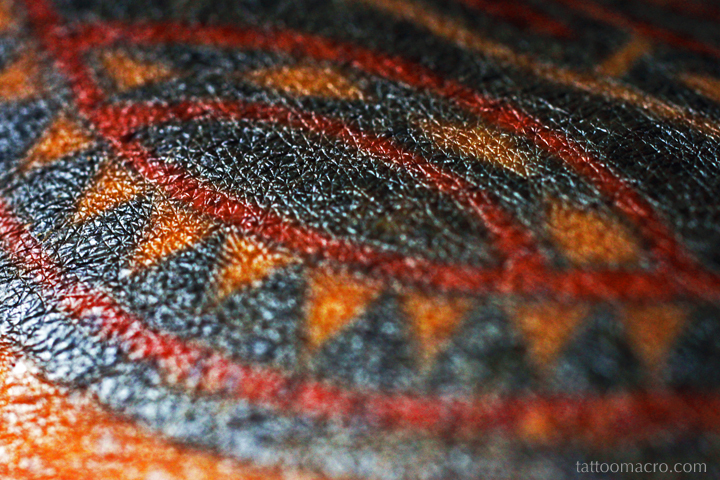 However, the practice of piercing, tattooing and ritual scarification have endured for eons. Even when the bubble bursts there will be a significant core of diehard individuals remaining. As in all markets, the correction will come. That is when the value becomes (remains) more than economic. If you could give one piece of advice to someone who wants to get a tattoo, what would you say? Find a tattoo artist with an art background. Anyone (well, not anyone) can apply the transfer and fill in the colors with flash. We all have a vision of what our tattoo should be. You need the artist’s eye and skill to create the final good. Having a platform to reach multitudes (well, some very high-quality people we call our friends, but this could change…someday…), is there any message you’d like to amplify? No. Let the eye interpret as it will.